back left going clockwise: Brian D’arcy James, Molly Ringwald, Sam McCarthy, Melissa B. Miller, Brendan Meyer. and photo taken by Katie Leary. Melissa Miller-Costanzo recently wrote for Filmmaker about how she moved from below-the-line production work as an art department coordinator to the writer/director of an independent feature, All These Small Moments. Here, she follows up that article with this reflective piece about all the things she learned on her 18-day first-time shoot. “Okay, here’s some dialogue, we won’t hear it, it’s just something so your mouths will be moving. You’re coming home from a parent-teacher conference and discussing your son’s issues; that’s why you’re together.”Alright, and ACTION! “Um, Melissa,” a PA walkie’d me from outside while I watched the monitor inside. “Molly and Brian have a question for you.” How could they possibly have a question, I thought to myself. They have the new dialogue, they know where they’re coming from. “Yeah,” I spat into the walkie. And such is your first experience with directing — learning what your actors’ needs are and being pliable with each one. With unbelievable talented and seasoned actors, I got extremely lucky my first go round. Some of my actors asked questions and loved creating a backstory, and others liked to just jump in and try things. For others, it was their first movie. 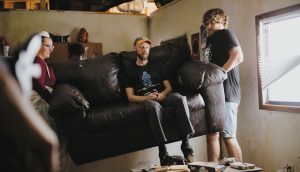 What had made me nervous, however, going into my first feature wasn’t so much working with the actors, but how I was going to communicate what I wanted with my DP, Adam Bricker. I had done this exercise during soft prep so I was prepared and excited to see how we were going to translate my notes into shots. Adam would draw everything out and keep checking in to make sure it was what I wanted. I learned quickly to work in overhead schematics, which wasn’t easy at first. But as prepared as we were for day one, I also learned sometimes the best thing you can do is throw away your shotlist and let the actors dictate where the camera goes. Of course we had to schedule our Steadicam and other special equipment days, but for the most part, we’d invite the actors to set and see where they landed naturally. We’d let them “do it like a play.” This became our mantra for the whole show. We knew this would be the best way to capture the naturalness we were striving for. If the actors felt restricted or manipulated into a position, we felt the film would suffer as a result. 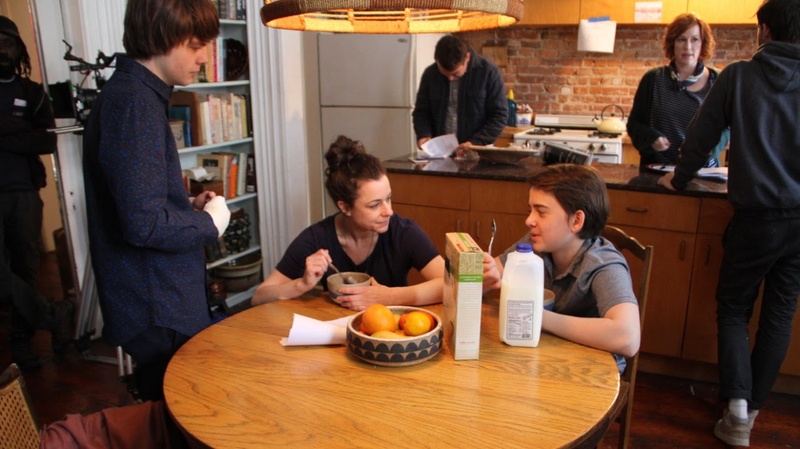 The hardest part for me as a first-time director was arriving at set in the morning and setting up our first shot. Again, because of our budget restrictions we didn’t have a lot of prep time so much of the time we were locking locations without properly scouting them. So, it wasn’t uncommon to see the locations for the first time when we were shooting them. As they should, the producers, AD and many of the crew would circle us like hungry birds as Adam and I discussed the shot. Since I was still gaining my confidence as a director, I felt very much like I was standing naked in front of a crowd of people. I felt like they were judging me and questioning my choices. When I expressed this to Adam, he suggested he and I have the set to ourselves first and once we arrived at our shot, then we’d invite everyone else. This small adjustment made a world of difference, and it built up my relationship with him because I knew he always had my back and my best interest in mind. Throughout the shoot, as we were figuring our shots, Adam, who has much more experience than me, needed to find his own way to communicate with me as my technical vocabulary wasn’t completely up to snuff. He found that if he’d frame something up on in his Artemis app on his phone, which he had programed to our 2:1 aspect ratio, than he could speak to me visually. This was again invaluable as I’d immediately be able to react and let him know whether I liked it or wanted to move in closer, or frame something a different way. This soon became secondhand to us, and we were able to move quicker and smoother throughout the day. Another huge takeaway from the shoot I learned is to make sure you shoot tons of b-roll. It seems like something you’d remember as a director, but when things move quickly it can easily fall through the cracks. I wish I would have shot more, not only for transitions but for the opening title sequence. In fact, you’ll be a step ahead if you go into your production with an idea for a title sequence and try to get the shots needed during principal photography.